Nuclear waste: Back to Yucca Mountain? Some lawmakers and the nuclear industry want President Obama to reconsider the now-shut Nevada nuclear waste facility, seen here. Others say it's a terrible spot and should remain shut. NEW YORK (CNNMoney) -- There are 65,000 tons of radioactive waste sitting at nuclear power plants close to major cities around the country. The government and the industry say it's safe where it is for the time being. But in the age of terrorism and tsunami-ravaged nuke plants, many have their doubts. By law the government is supposed to take this waste and store it permanently deep underground. It's been collecting money through fees on electricity bills for this purpose since 1983 and should have begun disposal in 1998. 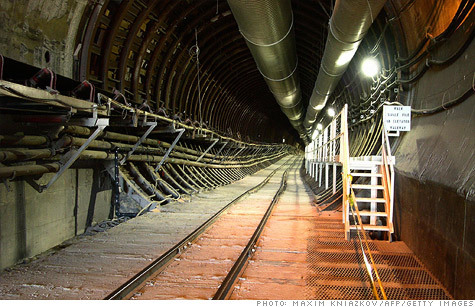 Thanks to a slew of legal and technical challenges, the government's once-chosen site -- Nevada's Yucca Mountain -- remains a half-built, $15 billion empty hole in the ground. Many say the inability to deal with nuclear waste long term isn't just a security threat, it also hobbles domestic energy production. Lack of a repository, they say, is part of what prevents utilities from building more nuclear plants. Some say carbon free-electricity from nuclear power is essential in the fight against global warming. Yet shortly after taking office the Obama administration, a staunch supporter of nuclear power, scrapped Yucca Mountain permanently and formed a commission to find a new location. Now a group of Congressmen, backed by the nuclear industry, is trying to reverse that decision. Located in the middle of the desert a hundred miles northwest of Las Vegas, Yucca Mountain seems like the ideal spot for a nuclear waste repository. There's no one around. The mountain sits at the intersection of three pieces of federal property: a rarely-used Bureau of Land Management parcel; an Air Force gunnery range; and an old Energy Department testing ground for atomic weapons. Supporters say it's dry enough so water won't erode the casks that hold the waste or carry radiation outside the mountain. They say it's also not prone to earthquakes, and the old volcanoes nearby aren't a threat. "I challenge anyone to find a better site," said Steven Kraft, director of special projects at the Nuclear Energy Institute, the industry's policy arm. "No site is perfect, but almost all the things that make for a good repository, Yucca has." They say the money, time and effort the government has put into developing this site shouldn't be wasted. "We now have an administration that wants to erase the visionary effort launched by President Reagan, casting aside three decades of scientific research, bipartisan collaboration and a fortune invested to start from scratch, no matter what the cost or consequences to our national security," said Fred Upton, the Michigan Republican who's a driving force to reopen Yucca, during a recent House hearing. Upton and other lawmakers contend the administration doesn't have the authority to unilaterally close Yucca, and have asked the Nuclear Regulatory Commission -- the agency charged with overseeing nuclear power safety -- to rule on the matter. They also point to a preliminary report from the NRC that they say suggests Yucca is a suitable site. An NRC spokesman would only say that the report was just part of a larger study, the results of which have not been released. The charge among Yucca supporters -- not usually mentioned outright but always implied -- is that the decision to stop construction was all political. Harry Reid, the Nevada Democrat who's now Senate majority leader, is an outspoken critic of the project. Supporters say the Obama administration scrapped Yucca to appease Reid. They note that the current NRC chair is a former Reid staffer, and that the NRC has been slow to rule on whether or not Obama can close the project. Yucca supporters accuse Energy Secretary Steven Chu of flip-flopping on the issue. Although he is now in favor of shuting Yucca Mountain, he was among a group of National Laboratory scientists who sent a letter to Obama in 2008 supporting the project. The White House, acting through the Energy Department, said the closure was because the people of Nevada don't want it and had nothing to do with Reid. "The project had been stalled by more than 20 years of public protest and legal opposition with no end in sight," said an Energy Department spokesman in a statement to CNNMoney. "We think the responsible thing to do is to move on to a better solution." Most environmental groups have been opposed to Yucca for years. They say the mountain has much more water in it than was initially believed, which could wear down the canisters that hold the waste, become contaminated, and leach into the surrounding environment. Plus, they say the area is more seismically active than previously thought and that volcanoes could pose more of a danger than the government is letting on. "Yucca is fraught with problems and I don't think there's any way it's coming back," said Geoffrey Fettus, a lawyer at the Natural Resource Defense Council. In addition to geology, critics point to other problems. Yucca was originally Shoshone land, taken by the federal government in 1951 for weapons testing, said Kevin Kamps, a nuclear waste specialist at Beyond Nuclear. And Nevada was chosen not because it was a good site, but because it had the fewest representatives in Washington of any state under consideration, critics say. "The most common name for that legislation was the 'Screw Nevada Bill,' " said Kamps. "It never should have been targeted to begin with." Kamps said better sites for a repository include deep granite formations in places like New Hampshire, Wisconsin or Minnesota. A new list of cites could still include Yucca, especially if its supporters succeed in getting the NRC to rule that the administration can't unilaterally take it off the table. But while all the bickering goes on, all that radioactive waste will stay right where it is -- sitting at power plants all across the country.